Dental implants look and function better than bridgework and dentures (also known as fixed and removable prosthetics). To support an implant, a specialist drills into the patient’s jawbone and inserts a titanium post, on which a dentist places a crown. The finished result gives the appearance of a natural tooth. In addition to being able to chew, talk, and smile without difficulty, the patient gains another important advantage from implants: preservation of the jawbone. After extractions, the jaw quickly begins to atrophy in the area of tooth loss. The bone loses as much as 25% of its mass in one year, eventually shrinking down to a narrow fraction of its original dimensions. This process has a dramatic effect on facial appearance. Over time, it can lead to a result known as facial collapse, in which so little remains of the jawbone that the nose and chin shrink together. The presence of natural teeth helps stimulate the jawbone and keep the body from dissolving it in a process called resorption. Implants have the same positive effect on the jawbone as natural teeth. In some patients, however, the bone needs a little help from dental science before it can support implants successfully. If the bone is too soft, or it lacks the mass necessary for implant placement, periodontists can use bone-grafting procedures to improve the implant site. A dental implant consists of a post that fits into the space normally occupied by tooth roots. Topped with a crown, bridge, or denture, this fixture replaces one or more missing teeth extracted because of decay, trauma, congenital deformity, failed root-canal treatment, or the wear and tear associated with extreme tooth grinding. Today’s implants trace their innovative technology to a Swedish orthopedic surgeon who invented them in 1952. A dental implant typically is made of titanium or another strong material that’s biocompatible, meaning that it doesn’t trigger an immune-system response in the body. The post sets below the level of the gums. As the area heals from implant surgery, the jawbone fuses with the titanium and provides a place to add an individual crown or to mount bridgework or dentures. A single endosteal implant can support a single-tooth restoration. A series of these implants can support a multi-tooth bridge, or a fixed or removable denture. The ideal candidate for dental implants is a healthy adult with fully grown bone structure; a firm, full jaw bone; and no sign of periodontal disease. As time elapses between tooth extraction and tooth replacement, the body dissolves and absorbs bone tissue at the extraction site. As a result, patients with soft bone, or those whose extractions long preceded their dental implants, may need specialized bone-enhancing procedures such as bone grafting to make implants function properly. Unlike conventional fixed and removable bridgework, implants don’t require support from the teeth next to the ones they replace. The teeth that support bridgework must be ground down so they can be crowned. With implants, no additional teeth need preparation. Because implants support themselves, they provide greater stability during speech and chewing. Like the roots of natural teeth, implants stimulate the jawbone and help preserve it, whereas under conventional dentures or bridgework, unstimulated bone deteriorates and disappears, gradually changing the functional fit of the dental appliance and making it look unattractive. 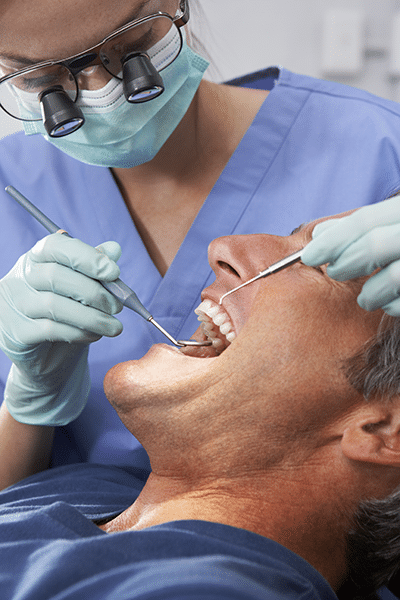 Before implant placement begins, a damaged or diseased tooth is extracted from the socket that will hold the implant. A pilot hole drilled into the jaw begins the process of providing a site for the implant post. The surgeon gradually enlarges the pilot hole until it is large enough to hold the post. With the post inserted, gum tissue covers the implant. Immediately following implant surgery, patients may see some swelling, bleeding, and bruising, and feel some discomfort. Pain management can rely on a combination of prescription and over-the-counter medications. Eating soft foods protects the surgical area from damage. During a healing period that lasts several months, the bone fuses with the implant hardware in a process called osseointegration. It’s critical to keep the area clean, and to avoid exerting excessive biting force on the healing implant. Follow-up dental visits remove any sutures, help keep deposits from settling on the implant, and assure that no inflammation or infection compromises the implant’s growing bond in the jawbone. After the hardware fuses in place, a connector called an abutment attaches to each post to form the base for a replacement crown, or to support a multi-tooth bridge or full denture. The final restoration may be fixed in place with cement or built with removable hardware.